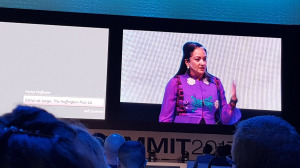 At the IAB Digital Summit, experienced editor and journalist Ferial Haffajee spoke about why it is important to pay for good journalism, amidst social media being used by those with their own agenda. Haffajee spoke to media update's Adam Wakefield at the IAB Digital Summit about the state of journalism in South Africa, what future journalists need to know, the near-term future of the country and how that future is covered. Several models are being tried by media companies to close the revenue gap once filled by print advertising and, according to Haffajee, the answer lies in the bigger picture. This is as the pool of beat reporters appears to be shrinking, with Haffajee giving labour and economics as two such fields where more reporters are needed. "In many places, our industry is becoming smaller and smaller, poorer and poorer," Haffajee said. "If you look at the profit levels of the major companies, they are either loss-making or in tiny profit. I do think the answer lies in a bigger picture, and that lies in philanthropists understanding the common good that lies in a robust and independent media." Further, as Haffajee argued in her speech, the owners of digital channels – where the big money lies – ­ should invest and pay more for journalism. Haffajee was asked whether the South African public takes for granted the free journalism they have enjoyed online for a number of years, and whether they do not want to pay for media. Her response was that media owners will acknowledge they made a fundamental mistake by giving their product away for free in the beginning. "I don’t know about you, but I pay for my news. I pay for the FT , I pay for The New York Times, I pay for good journalism because it’s quality, it’s specialised, and it’s sophisticated," Haffajee said. "The free model is an important democratising one in that you are making news free, but then what’s the quid pro quo in that? Who is going to pay for the journalist to do the important work and what do you do when you can see journalism weakening?" Most places, in her opinion, have opted to use what Haffajee calls a "sushi table option", where a number of offerings are put on a single plate for a consumer to choose from. The strength of the model is based on economy of scale, with the model emerging from the likes of The Telegraph and other large newsrooms. Locally, Times Media Group’s consolidation of its business-orientated titles into BusinessLive is such an example. Responding to the question of what is critical for journalists entering the industry to know, Haffajee noted a couple of skills she has recognised among those she has worked with. “I’m lucky that I do a number of things and I’m working with and learning from some amazing journalists. They know how to mine data and make it clear to audiences. They know how to follow money, [such as the] Panama Papers and the work that was done on our continent,” Haffajee said. Interestingly, for Haffajee, this is not necessarily being done in large newsrooms. Instead, journalists are using these skills on their own. “They’re saying, ‘Bugger this. This is the journalism I want to do and I’m going to do it in my own company’,” Haffajee said. She believes the ANC is currently in campaigning mode, and the race to become its next president will be wider than Deputy President Cyril Ramaphosa and Nkosazana Dlamini-Zuma. She says the challenge for journalism is how to go beyond Luthuli House and ANC Youth League press conferences and understand those who will choose the next president of the ANC at the end of the year. Digital measurement is an important piece of the online pie, and it is changing, but how? Read more in our article, The future of digital measurement is across devices and media.